Sealcoating provides resistance to elements that can soften asphalt, enhances asphalt appearance by restoring the original jet black color, and is easier to clean and maintain while extending the life of your pavement. Sealcoating can double the life of your pavement! 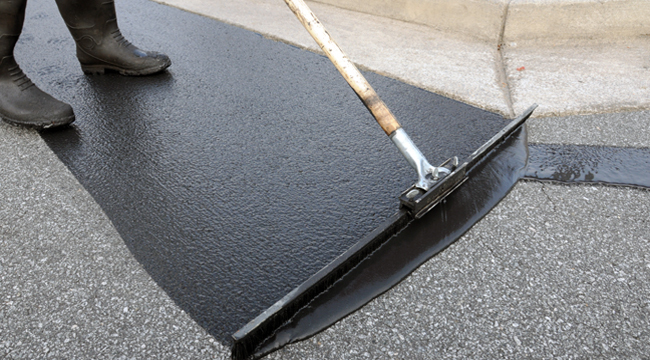 Quality Sealcoating is most effective in protecting your asphalt investment. Our sealers resist water penetration and protect against cracking from oxidation and weather extremes. Sealcoat applied to asphalt pavement ultimately protects against deterioration, crumbling, and shrinkage. Over time, exposure to weather extremes and petroleum products such as oil, gasoline, and even cooking fats from an outdoor grill can reduce a gleaming asphalt surface to a cracked, beat-up eyesore. It’s not just the damaged appearance that eats away at your investment- decreased water resistance and load-bearing capacity can turn a high-end asphalt surface into a deadly hazard. All American Sealcoating applies Sealcoating products tailored for each particular situation to form a tough protective coating over your parking lot. ✓ Copeland Action Pave Latex Sealer with Sand mix. Please Note: AASCS&LC can not be held responsible or liable for damages occurring to personal property due to any natural causes or property owner neglect. For example:, natural weather, snow, ice, rain storms, thunderstorms, hailstorms, high winds, fallen leaves, sprinklers, animals, children or vandalism.